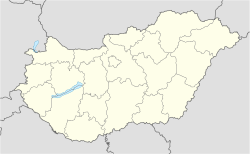 Martfű is a town in Jász-Nagykun-Szolnok county, in the Northern Great Plain region of central Hungary. Tisza Shoe Factory: Though designed prior to the outbreak of war. In 1941-42 a factory was established by the Czechoslovak businessman Jan Antonin Bata, whose organization was based in Zlin, Czech Republic. The resulting factory complex and industrial town was built in Martfu, Hungary. The Hungarian shoe company called Cikta. The decades of the Kádár era Tisza Cipő became the country's largest shoe manufacturer. Brewery: 1985, built by the surrounding businesses. Vegetable Oil Factory: built between 1976-80. Primarily grown in the Great Plains sunflower, canola and soybean processing is carried out. Tisza Ipartelep plants: various industrial plants in the industrial and service center. Martfű name written in Szekely-Hungarian script and Latin letters. It covers an area of 23.08 km2 (9 sq mi) and has a population of 7366 people (2002). Wikimedia Commons has media related to Martfű. This Jász-Nagykun-Szolnok location article is a stub. You can help Wikipedia by expanding it. This page was last edited on 15 February 2019, at 23:37 (UTC).